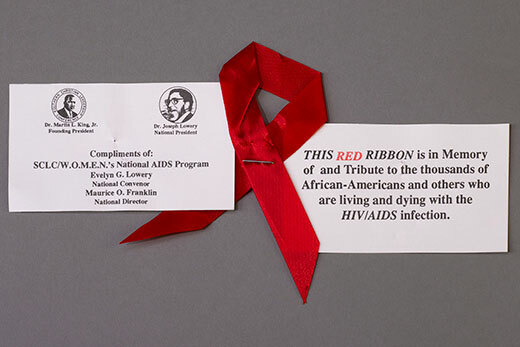 A red ribbon from SCLC/W.O.M.E.N.’s National AIDS Minority Information and Education program, circa 1985-1995. Credit: SCLC/W.O.M.E.N. records, Rose Library at Emory University. The Stuart A. Rose Manuscript, Archives, and Rare Book Library has received an Institute of Museum and Library Services (IMLS) grant of $107,706 to organize a community-based project that will address the rising rates of HIV/AIDS in the Atlanta metropolitan area. Entitled “Revisiting R.A.C.E. : Leveraging Archival Resources for AIDS Education,” the project will forge connections among medical, academic, social service, religious, advocacy and artistic communities to raise awareness and combat the epidemic. More than 54,000 Georgians are living with HIV (with two-thirds of them residing in the Atlanta metro area) and an average of 3,000 are newly diagnosed each year. Georgia ranks fifth in the U.S. for the total number of people living with HIV, second among states in the rate of new HIV diagnoses, and third in the number of people living with an AIDS diagnosis (based on a 2015 report from the Georgia Department of Public Health). The southeastern U.S. is now the epicenter of the HIV/AIDS epidemic in the nation, and this requires a collective effort on the part of organizations, institutions, academic centers and individuals to confront, according to del Rio. As home to the archives for the AIDS Legacy Project and the historic documents of SCLC/Women's Organizational Movement for Equality Now (SCLC/W.O.M.E.N. ), the Rose Library has been at the forefront in documenting the city of Atlanta’s response to AIDS. With the help of the IMLS grant, the Rose Library will use its resources to educate and empower the Atlanta community and connect the stories of diverse groups to unite them through a shared history. SCLC/W.O.M.E.N. can offer a robust volunteer roster, an existing Task Force on Health and Welfare and a deep understanding of the needs of Atlanta’s African American community. The Stuart A. Rose Manuscript, Archives, & Rare Book Library collects and connects stories of human experience, promotes access and learning, and offers opportunities for dialogue for all wise hearts who seek knowledge. Located in the Woodruff Library building of Emory University, students, scholars, and other visitors can browse rare books, read original letters and manuscripts, and listen to rare recordings. The Rose Library’s renowned collections span more than 800 years of human history—with particular depth in modern literature, African American history, Emory University history, and the history of Georgia and the South. To learn more visit http://rose.library.emory.edu. The Institute of Museum and Library Services is celebrating its 20th anniversary. IMLS is the primary source of federal support for the nation’s 123,000 libraries and 35,000 museums. Our mission has been to inspire libraries and museums to advance innovation, lifelong learning, and cultural and civic engagement. For the past 20 years, our grant making, policy development and research has helped libraries and museums deliver valuable services that make it possible for communities and individuals to thrive. To learn more, visit www.imls.gov and follow us on Facebook, Twitter and Instagram.